Dan Deacon sets his stall out early on ‘Spiderman of the Rings’, his first widely distributed album, released in 2007. ‘Wooody Woodpecker’ takes the (near) titular cartoon cackle-bird and turns his laugh, processed into high and low versions, and layers it into total cacophony. It’s hilarious, then overwhelming, then a little scary, as when something that seems good feels like it might actually be really, really bad. This fun house could actually be run by an escaped madman. It’s impossible to know whether to classify this as bubblegum pop or total noise war, and there aren’t that many opening tracks that straddle that particular dichotomy. His deranged approach to music making is what makes this a wild and intoxicating world in which to spend time. Deacon, as evidenced here, is a maximalist by gleeful instinct, always piling stuff atop more stuff and pushing it all to the point where the heap starts to break down and collapse in on itself. Reference the synth line in the middle section of ‘Wham City’. It starts like a simple-enough high-pitch oscilloscope tone and runs this way for a few bars. For the second pass Deacon adds more variation, the peaks are higher, the troughs lower, the oscillations more varied. By the third and final run through these ups and downs have been whipped into a crazy sonar jack-knife switching back and folding in half upon themselves. This sequence repeats for a number of minutes, a clear testament to an artist who will push from statement to over-statement to sheer lunacy in three easy steps. Note that this passage is but one in the middle of a 12 minute epic which is more notable for the schoolyard chant that runs throughout it and which I reproduce here as it epitomises and encapsulates the qualities of Deacon’s music better than I ever could. Deacon is a kid in a candy store who has quickly scoffed all the most additive-laced sweets and is now smashing his way into the toy store next door to grab the cheapest musical instruments he can find to make havoc with. Dance music is his milieu (although he has also worked significantly in contemporary classical) but glee is his mode. His live shows are legendary. He regularly sets up his Heath Robinson collection of gear on a low table and floor level in the middle of the audience and just goes from there. It’s this simplicity of approach that drives Deacon’s music like a pounding little heart. That he uses these simple starting materials: joy, enthusiasm, a grab-bag of music-making equipment and a willingness to put the pedal to the floor and builds such insanely overwhelming music from them is very impressive. That he manages, in the midst of all this, to make music so deliriously convincing is a near miracle. 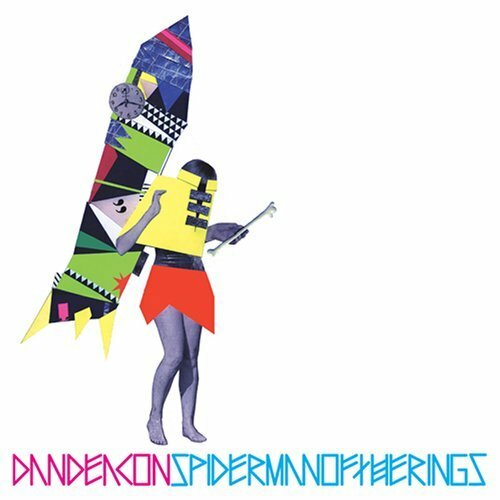 Tom listened: It has struck me, whilst reflecting on Spiderman Of The Rings, that what Dan Deacon manages to achieve is really quite remarkable. The playfulness, chaos and (seeming) naivety of the music on offer immediately brought to mind Animal Collective at their loosest and least structured. But Animal Collective have always sounded to me like adults trying to be children – Dan Deacon doesn’t sound like he is having to try at all. And I think the reason why is the fact that, unlike AC, Spiderman of the Rings is shot through with a sense of humour; a charming silliness that a five…or fifty…year old would appreciate (give or take five years here or there that describes me and my son, Kit – we both connected with the album straight away). Other words that spring to mind are bonkers and gleeful and neither are a bad thing as far as I’m concerned. In short, the boy Mitchell produces another cracker from his treasure trove of alternative sounds and noises. Graham listened: Basically what Tom said. Started off thinking this is a bit all over the place, but it charmed me fairly quickly after that. Uplifting and playful at the same time, is quite a trick. 100% agreed. This album blew my mind when it was released – how odd to see a guy so willing to start at the breaking point and build so far beyond it. I did think there’s a bit of a drop off after “Wham City” – that and “Crystal Cat” are just so intense and beyond everything that there can’t help but be one – but on a relisten there are plenty of neat things afterwards, particularly those final two tracks which are both gorgeous. Still, I think the Deac only got better from there – I still think the 4-part “America” is his best work and some of the most captivating road trip music ever, especially if you crank it!! If a successful DRC post is one that makes you put said record on that evening, this was certainly a winner! Actually, I only re-listened to Woody Woodpecker and Wham City and as I seem to remember these being far stronger than the rest of the album, but I love the fun brashness of it. I remember seeing him at Coachella around this time and the live show description was awesome – he basically got a whole tent to do a Dan Deacon style conga!